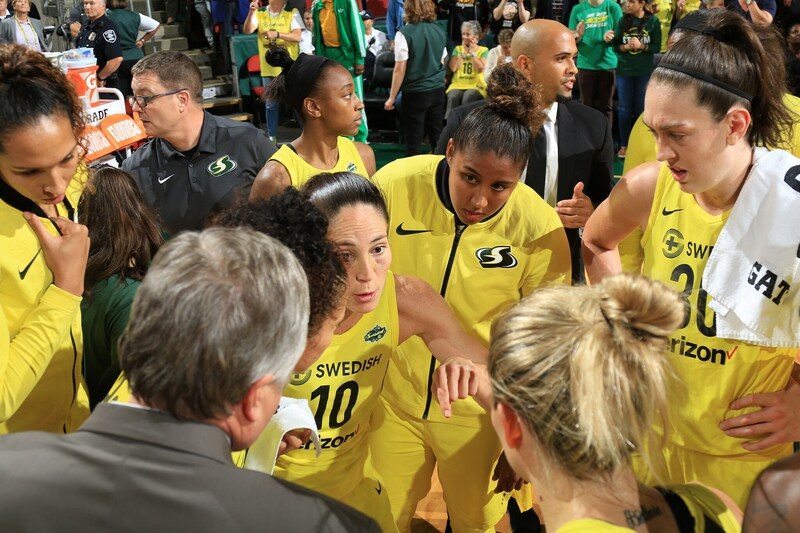 MAY 25: the Seattle Storm huddle during the game against the Chicago Sky on May 25, 2018 at Key Arena. JUNE 19: Doppler of the Seattle Storm waves a flag to pump up the crowd prior to the game against the Las Vegas Aces on June 19, 2018 at KeyArena. JULY 28: Breanna Stewart, Jewell Lloyd and Sue Bird of the Seattle Storm poses for a portrait prior to the Verizon WNBA All-Star Game at the Target Center on July 28, 2018 in Minneapolis. 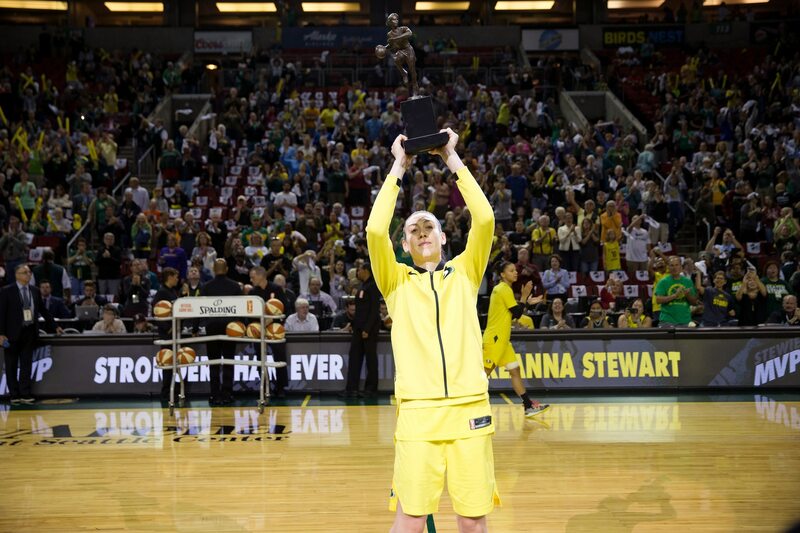 AUGUST 26: Breanna Stewart #30 of the Seattle Storm holds up the MVP award trophy before the game against the Phoenix Mercury during Game Two of the WNBA SemiFinals at KeyArena in Seattle. 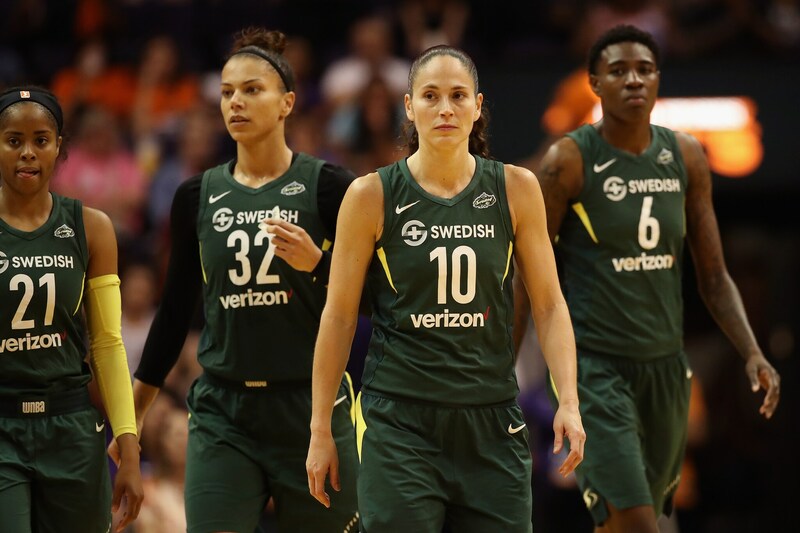 AUGUST 31: Sue Bird #10 of the Seattle Storm walks down court with Jordin Canada #21, Alysha Clark #32 and Natasha Howard #6 during game three of the WNBA Western Conference Finals against the Phoenix Mercury. 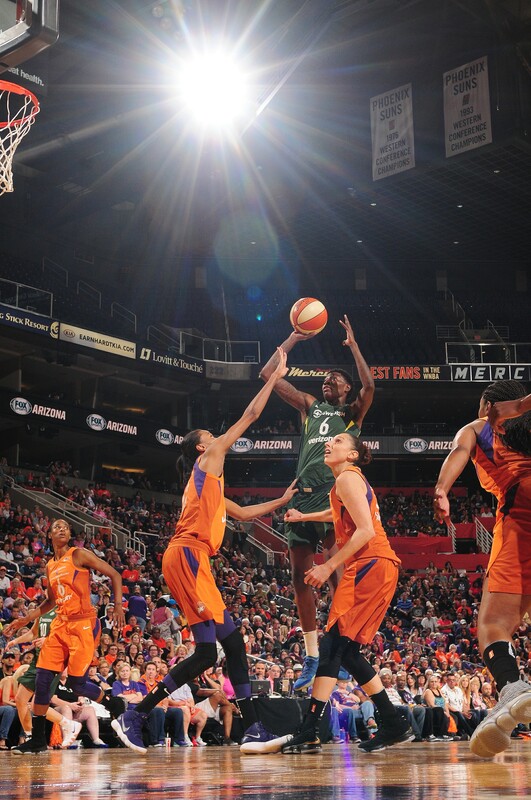 AUGUST 31: Natasha Howard #6 of the Seattle Storm goes to the basket against the Phoenix Mercury during Game Three of the WNBA Semifinals. SEPTEMBER 4: Natasha Howard #6 of the Seattle Storm is introduced before the game against the Phoenix Mercury during Game Five of the 2018 WNBA Playoffs. 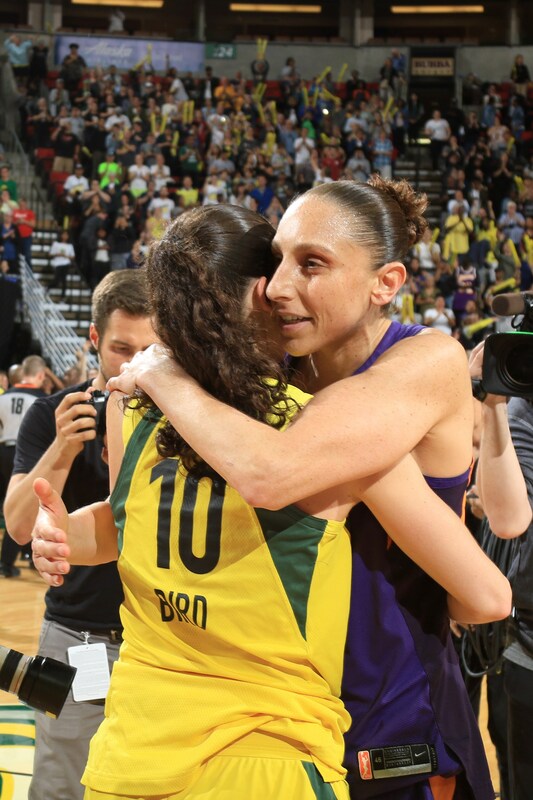 SEPTEMBER 4: Sue Bird #10 of the Seattle Storm and Diana Taurasi #3 of the Phoenix Mercury hug after the game during Game Five of the 2018 WNBA Playoffs. 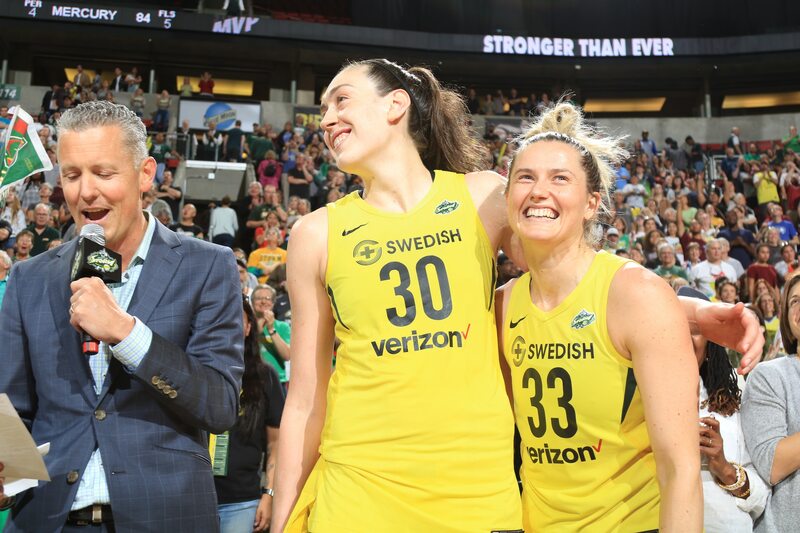 SEPTEMBER 4: Breanna Stewart #30 and Sami Whitcomb #33 of the Seattle Storm hug after the game against the Phoenix Mercury during Game Five of the 2018 WNBA Playoffs. SEPTEMBER 4: Sue Bird #10 of the Seattle Storm talks to her team during a time-out against the Phoenix Mercury in Game Five of the 2018 WNBA Playoffs. SEPTEMBER 7: Jewell Loyd #24 of the Seattle Storm reacts during the game against the Washington Mystics during Game One of the 2018 WNBA Finals. SEPTEMBER 12: Members of the Seattle Storm celebrate after defeating the Washington Mystics 98-82 to win the WNBA Finals at EagleBank Arena. SEPTEMBER 12: Sue Bird #10 of the Seattle Storm yells and celebrates with her teammates on court after Game Three of the 2018 WNBA Finals against the Washington Mystics. 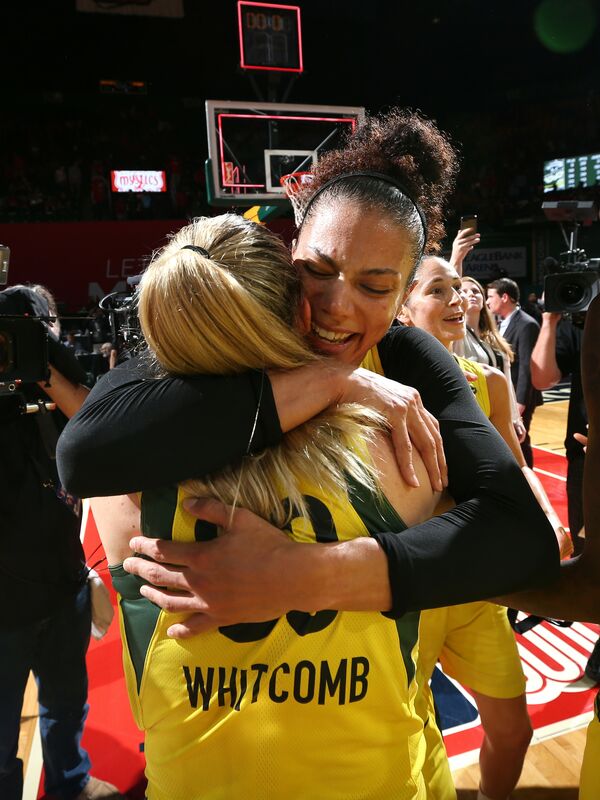 SEPTEMBER 12: Alysha Clark #32 of the Seattle Storm celebrates with Sami Whitcomb #33 of the Seattle Storm after winning the WNBA Champioship against the Washington Mystics in Game Three of the 2018 WNBA Finals. 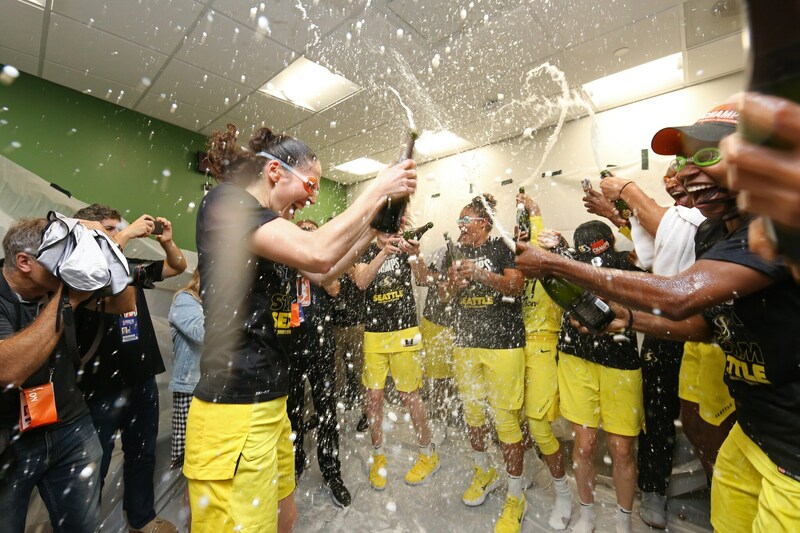 SEPTEMBER 12: Sue Bird #10 of the Seattle Storm celebrates in the locker room after winning Game Three of the 2018 WNBA Finals against the Washington Mystics. SEPTEMBER 16: Sue Bird #10 of the Seattle Storm raises the Storm flag at the Space Needle today before the parade to celebrate their championship in Seattle, Washington. 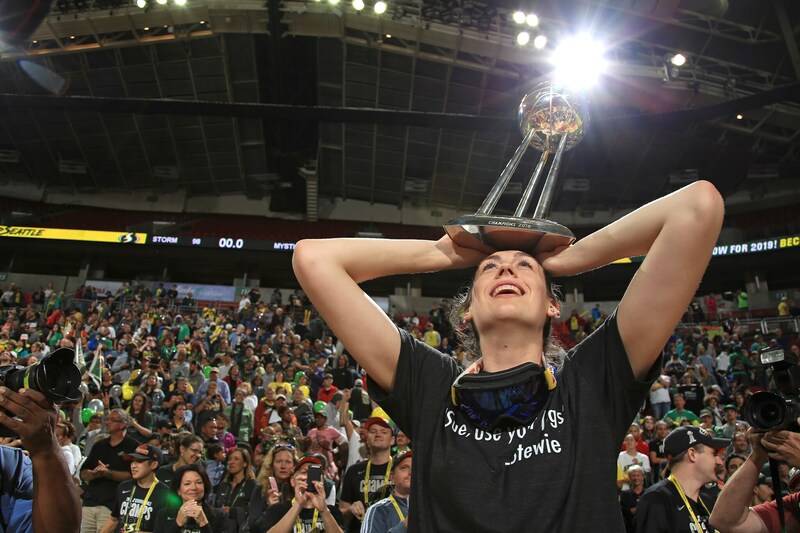 SEPTEMBER 16: Breanna Stewart #30 of the Seattle Storm takes it all in during the the parade celebration for their WNBA championship in Seattle, Washington.